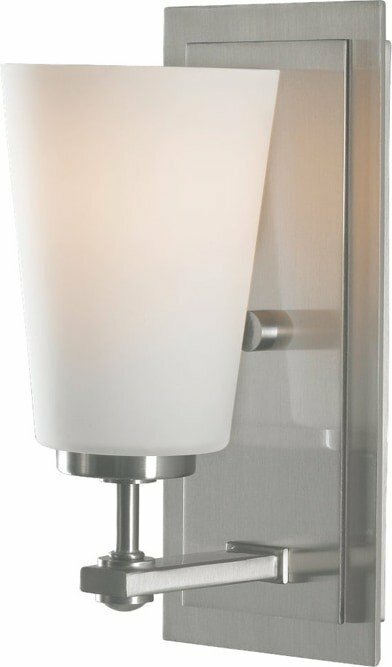 The Feiss Sunset Drive one light vanity fixture in brushed steel offers shadow-free lighting in your powder room, spa, or master bath room. Textures and geometric shapes evoke an organic feel to modern forms. Cylindrical pearlescent glass shades with a hand applied striated finish combine with steel arms are a few attributes these pieces posses. Corinthian Bronze finish will combine beautifully with a natural color palette to make a subtle but powerful presence. 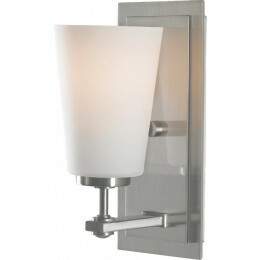 The Murray Feiss VS14901-BS Sunset Drive collection Sconce Wall Lighting in Brushed Steel uses Incandescent light output and brings Modern style. This item is 10"H x 4.5"W x 5.75"D. The total wattage is 60 and the voltage is 120 volts. The Murray Feiss VS14901-BS requires 1 bulb. Additional Information: Shade-White Opal Etched Glass.